The DS-11 / DS-11 FX Series Quick Start Guide provides users with a quick tour of the most important functionality of DeNovix spectrophotometers and fluorometers. Learn about fluorescence vs. UV-Vis absorbance and when fluorescence quantification is the better choice for the best results. 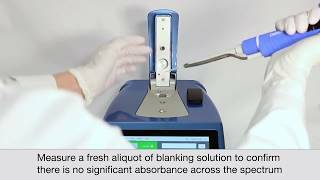 The video shows a demonstration of fluorescence quantification on DeNovix fluorometers. Simple and powerful ways to easily export your results. Your data, how you want it. Simple steps to follow to clean microvolume surfaces on DeNovix microvolume spectrophotometers. DeNovix DS-11 Series Spectrophotometer / Fluorometers include provides fluorescence and UV-Vis absorbance in one compact instrument. Quantify 0.0005 - 37,500 ng/uL dsDNA on the same instrument! The DS-11 and DS-11+ Spectrophotometer allow simple, intuitive quantification of biomolecules via UV-Vis using as little as 0.5 uL of sample. 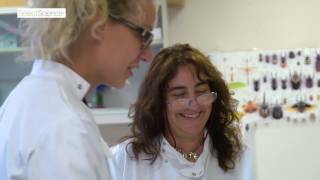 Dr. Alejandra Perotti explains her team's experience using the DS-11 FX to quantify samples originally preserved by Charles Darwin. 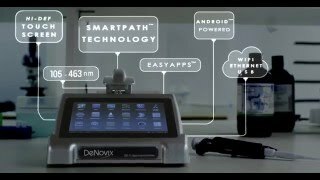 The DeNovix DS-11 Spectrophotometer utilizes proprietary SmartPath® Technology with Bridge Testing® to ensure microvolume sample results are accurate. The Bridge Testing™ algorithm tests for an unbridged liquid sample which can occur due to pipetting errors or unconditioned sample surfaces. When an unbridged liquid sample condition occurs the optical connection between the upper and lower sample surfaces is interrupted and results are inaccurate. The DeNovix DS-11 using SmartPath® Technology with Bridge Testing® eliminates concerns associated with unbridged sample errors. This innovative feature makes the DS-11 the ideal spectrophotometer for laboratories working with nucleic acids and proteins and enables the researcher to have the highest confidence that their microvolume measurement data is accurate.